Foreigners will be banned from owning land in South Africa under new proposals outlined by President Jacob Zuma. Locals will have limits set on the size of their farms under the proposals. 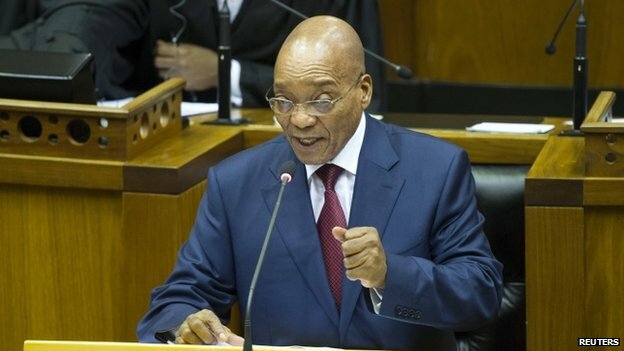 Mr Zuma first announced them in a state of the nation speech on Thursday overshadowed by violence in parliament. Two decades after the end of apartheid, land is still concentrated in the hands of a largely white minority, and remains a sensitive issue. The government is under growing pressure to put more land in the hands of the country’s black majority. “Land has become one of the most critical factors in achieving redress for the wrongs of the past,” said Mr Zuma, elaborating on the plans on Saturday. In the future, foreigners will only be allowed to lease land, not to own it, he said, adding that local farmers would not be able to own more than 12,000 hectares. That is presumably aimed at white farmers who still own much of the best farmland a generation after the end of racial apartheid, says the BBC’s Andrew Harding in Johannesburg. There are many reasons for the slow pace of change in the country, says our correspondent, and these new proposals will face strong legal challenges from farmers who argue that smaller plots will not be commercially viable. But the governing African National Congress is looking for votes, and is wary of being outflanked by more radical voices calling for white-owned land to be seized without compensation, he adds. On Thursday, parliament descended into chaos as leftist MPs scuffled with security during Mr Zuma’s key annual speech. The EFF used President Zuma’s annual State of the Nation speech to question him about a state-funded, multi-million dollar upgrade to his private residence. The party has shaken up South African politics with a series of populist proposals to redistribute wealth. Posted on 15th February 2015 by newsafrica. This entry was posted in Africa, EEF, Land Redistribution, South Africa. Bookmark the permalink. « Brown Ideye, Africa’s new football sensation?